Current USA Orbit Marine is one of the best LED lights for reef tanks on the market today. This product not only provides high output lighting for growing corals but also offers you to fully customize its intensity and spectrum to meet the needs of your corals. Moreover, it is designed with a controller with remote control for easy use and automatic operation. You only have to program the light once time and the fixture will repeat the preset cycle everyday to make your reef tank thrive. This review is composed to help you to understand more about this product as well as how easy to use it. The Orbit Marine LED light is one product in the Orbit Marine series, which also include Orbit Marine PRO, Orbit IC LED, and Orbit IC PRO. These products are designed for different types of corals from low to high light. 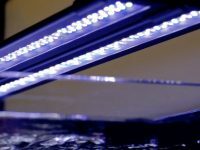 Basing on the previous tables, the manufacturer recommends the Orbit Marine LED light for marine fish, soft and LPS corals that need lower PAR output to thrive, and the Orbit Marine PRO or Orbit IC PRO for higher demanding corals. In conclusion, if you have low light corals such as soft corals, zooanthids, mushrooms and low light LPS that require PAR from 35 to 100, the Orbit Marine LED light is enough to provide sufficient light for the tank. The best feature that makes the Orbit Marine stand out from other LED lights for reef tanks is the combination its dual daylight and dual actinic LED spectrums for better experience and healthy coral growth. Moreover, the fixture uses 120 degree lenses for an excellent spread with optimal color blending. 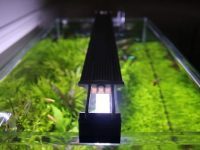 This special design offers the light to provide various stunning color effects thorough your tank and support the healthy growth of marine fish, inverts, live rock and corals. The Orbit Marine LED light includes a controller which is programmed with 24 hour on/off time for an automatic lighting cycle and free-hand control. 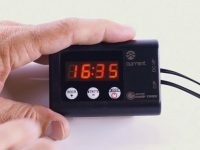 Moreover, the intelligent timer can offer 15-minute transient periods, in which the light changes its intensity to stimulate gradual sunrise and sunset effects like in nature. Thanks to that, your fish and corals will not be stressed by the sudden changes of lighting modes during a day. 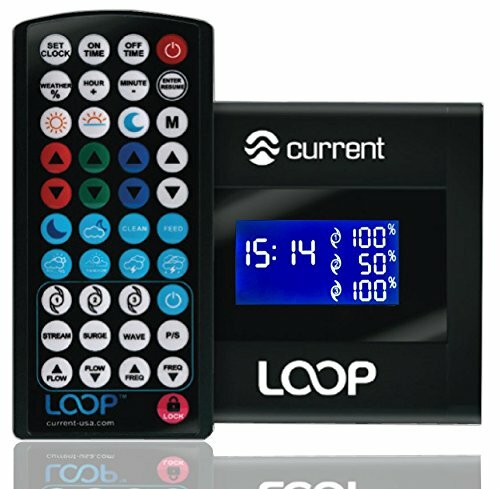 The timer controller also allows you to fully customize its lighting intensities and schedules. You can adjust the intensities and duration of daylight, moonlight and sunrise/sunset modes separately to meet the requirements of your corals as well as your preference. 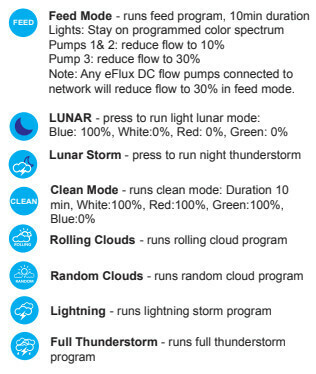 Besides the 24 hour automatic lighting feature, the Orbit Marine LED light also offers various lighting effects and modes such as feed and clean modes, lunar, lunar storm, rolling clouds, random clouds, lightning, full thunderstorm. 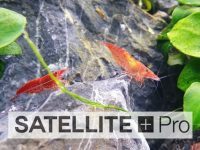 These modes mimic common weather patterns found in nature and add amazing lighting effects to your aquarium. To exit the weather mode, simply press the weather % button for 5s again. Press weather pattern desired, choose either rolling clouds, random clouds, lightning or full thunderstorm. Press Enter Resume to complete the process. Now, the daily weather is set and will run during daytime. You can also use dynamic weather and moonlight modes directly by simply pressing the pattern you want. The mode will effect right away and last for 30 minutes, then resume into normal programming. To exit these on-demand modes, simply press Enter Resume. There is also a memory slot (M) for you to build and save your favorite color. Use color adjustment buttons to adjust Red/ Green/ Blue/ White color spectrums 0-100% to achieve the color you want. This mode can be used in the same way as other on-demand modes. 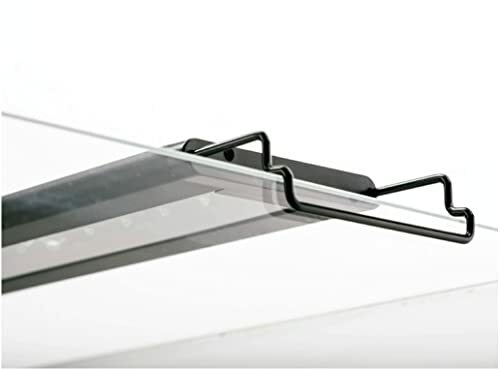 The Current USA Orbit Marine LED fixture comes with sliding docking legs which are extendable to perfectly fit on a wide variety of aquarium sizes. There are four available fixture sizes for tanks from small to large. It is very easy for you to set up and program the light follow a step-by-step instruction from the manufacturer. You can download the user manual of the Orbit Marine by this link.